The best remote desktop client for iOS makes its way into the desktop! Connect to all your VNC (Screen Sharing), RDP (Windows Remote Desktop), SSH and Telnet sessions from one app. 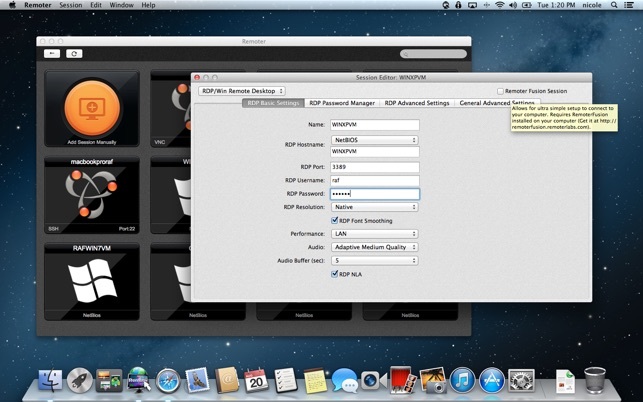 Supports audio streaming for OSX and RDP. Remoter is intuitive and very easy to use!. Also, support is available at http://remoterlabs.com including a user forum. ●A complete solution, no in-app purchases. ●Support for recording and running Macros! ●International keyboard support for servers that don't support direct input mode: German, Swiss-German, Russian, French, Danish and Spanish Keyboard mappings. I use this for remote desktop access to Window servers. It works very well, however I still have to go to Microsoft's offering periodically because this does not support copy from the remote OS to the Mac. 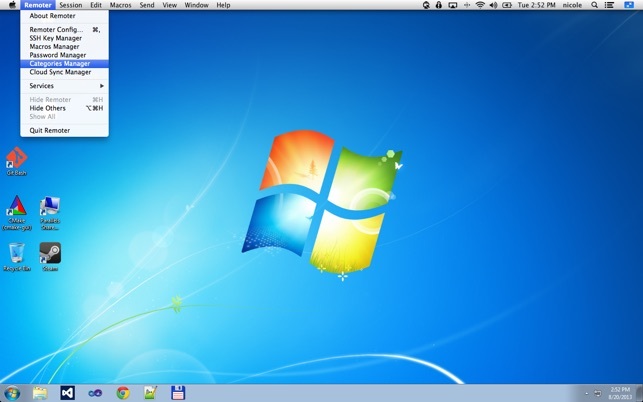 Copy/Paste does work within the remote desktop, as does paste from Mac to the remote desktop, but copy from the remote to anything running on the Mac does not work. The other missing feature is the ability to mount your OS X folders on the Remote Server. This can be very useful to transferring files back and forth. While it works in Microsoft's remote desktop it does not in this product. All this being said, since I have to work with many sessions at once, Remoter is my go to because of its excellent support of full screen and spaces on OS X, making moving between various servers very easy. This is an excellent app, that just needs some extra love to make it work more naturally on the Mac. It's iOS counterpart is the best I've seen! But while the features are mostly all here in the Mac version, and the developer has done a great job bringing it over from iOS, it still needs some more TLC to make it really feel like a Mac desktop app should. -- The experience of talking with the developer and getting bugs fixed has been great though. I'd give it 5 stars, but it really does have enough room for improvement that I think it doesn't quite deserve the 5-stars the iOS version gets. I expect it to get there though considering my positive interactions with the developer! I whole-heartedly recommend the app despite a few shortcomings -- mostly in the UI realm. I use this version, the ipad version, and the iphone as well. The app is nicely done and easy to use. The settings are different than most Mac apps so it will take a little getting used to because of its "iOS feel". I love the looks, feel, functionality, and features. I have had zero issues with it and I connect to ~20 computers/servers on various platforms daily.